Some people who overcome a life-threatening illness feel motivated to give something back to those who helped make their recovery possible. Charlie Willwerth, a 61-year-old leukemia survivor and bone marrow transplant recipient from St. Augustine, Florida, is taking steps to help bring life-saving stems cells to others in need of a bone marrow transplant. 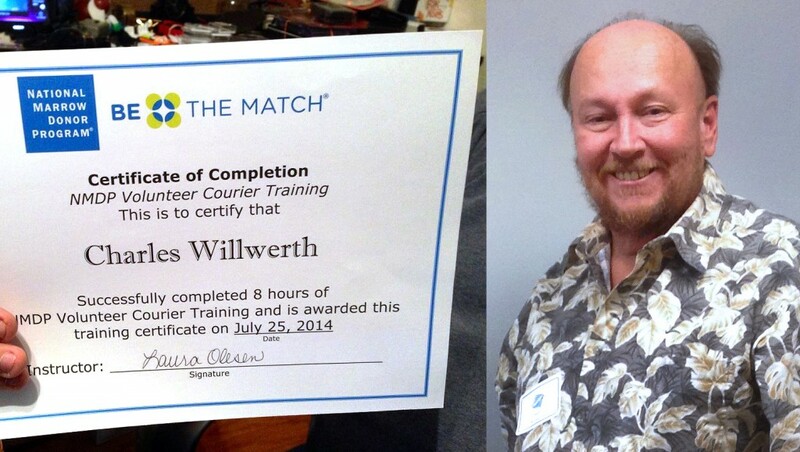 Two years out from his bone marrow transplant, and with his leukemia in remission, Charlie recently completed courier training with Be The Match, the world’s largest bone marrow registry, to become a volunteer stem cell courier. His new “job” -- transporting life-saving stem cells from a donor’s location to a matching recipient -- can take him anywhere in the world. Charlie’s discovery of his leukemia came as a real shock. After 22 years as an air traffic controller, he retired in 2003. He then became involved in an aviation radio show called “Flight Time Radio” on a local Jacksonville talk radio station. Other than undergoing heart valve-replacement surgery in 2006, his retirement life was pretty normal until 2011, when he noticed he was becoming easily tired and winded doing any kind of physical activity. A trip to his cardiologist and a series of blood tests, along with a bone marrow biopsy at a local hospital, revealed that he had leukemia. Charlie was referred to Mayo Clinic, where the diagnosis was confirmed. He was treated with a several-month chemotherapy regimen by his physician James Foran, M.D., a leukemia specialist. Things were looking good in the management of his disease until a serious relapse occurred in April 2012. “Mr. Willwerth initially responded well to chemotherapy treatment for his leukemia, but a relapse months later indicated that a bone marrow transplant was the best option he was going to have to cure his disease,” says Dr. Foran. During another round of chemotherapy treatments, Charlie was added to the Be The Match database (operated by the National Marrow Donor Program) but was told it could be many months before a matching donor could be identified. That’s when his miracle occurred. Only six weeks after being added to the database, a matching donor was identified. Charlie received his bone marrow transplant in September 2012. His donor was a young woman in her 20s from Texas, who had signed up to be a donor at a drive on her college campus. Today, almost two years from his bone marrow transplant, Charlie's leukemia is in remission, and he’s feeling stronger each day. Northeast Florida area residents can support the #UnitedInHope Be the Match Marrow Registry Drive on Saturday, Sept.13 from 12 noon-4pm at the St. John’s Town Center (in front of Maggiano’s). The event is sponsored by Mayo Clinic, Nemours Children’s Clinic and Wolfson Children’s Hospital in cooperation with Be the Match. For more information on this event and to learn about becoming a donor, visit http://BeTheMatch.org/UnitedInHope. Learn about Mayo Clinic's bone marrow transplant program. Join the discussion in the Cancer group on Mayo Clinic Connect, where they discuss leukemia.